Samsung doesn't need to do too much to hold its position as one of the premiere laptop makers, but it went ahead and did it anyway. Take the ATIV Book 9 Plus, for instance: For CES 2014, Samsung bumped things up and knocked specs down in its effort to hit the ultimate sweet spot in a new form factor. The result? 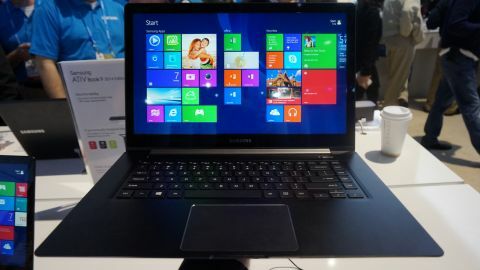 Dropping the "Plus" in its name, Samsung kept the same sleek, cobalt aluminum finish of its svelte 13-inch ultrabook. The company also squeezed another 0.6 inches out of its display, bumping it up to a 15.6-inch touch panel. However, the company knocked the Book 9's resolution down a peg from last year's 3200 x 1800 to a more standard 1920 x 1080. This is partly how Samsung can claim 14 hours of battery life on the Book 9, an impressive feat in endurance. Inside, you'll find dual-core Intel Core i5 or i7 chips (Haswell, natch) with Intel HD Graphics 4400 and 8GB of RAM. As for storage, you have a choice between 128GB (for Core i5) and 256GB (for Core i7) solid-state drives. Samsung managed to come in at just 4 pounds while increasing the Book 9's size, making it lighter and larger than Apple's standard-setting 15-inch MacBook Pro. Sure, Samsung had to make one large conceit to get there, but more on that later. Now, let's talk about a first that Samsung has made for the category. That's right, audiophiles: The ATIV Book 9 is the first laptop with native lossless audio support. Playing up to 24-bit, 192kHz audio, this notebook can playback CD-quality (or lossless) audio files at their full bitrate. Sure, you music nuts might already have a home setup that plays lossless just fine, but do you have something on the road that can? That's precisely the gap that Samsung wants to fill. Now, the size of the Book 9 speakers – tiny, if you're asking – certainly plays a role. So, Samsung set up a demo with one of its new speakers to demonstrate, and the audio was crystal clear even over the din of the CES show floor. (Not to mention an on-stage demo going on right behind me.) Sure, lossless audio playback is a niche feature for folks that actually care about this sort of thing, but it's a differentiator nonetheless. About that display … Samsung opted to go with a standard, 1080p panel rather than keep the 3200 x 1800 screen at 15.6 inches. The reason? Battery life. There's no way that Samsung could claim 14 hours of endurance with the Book 9 pushing that many pixels. Battery life has become one of the most important races in computing, with every year companies inching closer to the 12-hour mark during actual use. The ATIV Book 9 could very well be the first, at least in my experience; the MacBook Airs come in at about 9 to 10 hours. Now, here's why bumping down the resolution doesn't matter too much: Windows 8.1 isn't even ready for QHD or UHD resolutions. Most vendors increase the default magnification anyway to compensate for the extra pixels, so what's the point? I imagine Samsung asked itself the same question in crafting 2014's ATIV Book 9, and erred on the side of right. The Samsung ATIV Book 9 for 2014 isn't a mind blowing revolution on the previous model, but it's the smaller changes that make it an exciting rig. Coming in lighter than its main competitor and bumping up screen size is certainly no small feat for Samsung. And thanks to the size increase, Samsung was able to recess the keyboard deck for extra comfort and a more nuanced design. Three USB ports (with two being 3.0), HDMI out, mini VGA, an SD card reader and 720p webcam sweeten the deal. And frankly, I'll take a hit in display resolution if it means a whopping 14 hours of battery life. With stylish details like chamfered edges and an all-aluminum body, you should expect to pay a premium, though Samsung has been mum on pricing. What you can expect is to see the ATIV Book 9 2014 to drop sometime in the middle of, well, 2014.